Jim Raycroft joins superyacht Golden Compass on its global voyage. 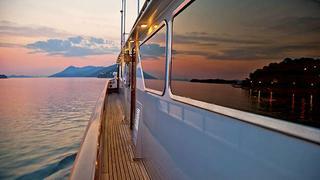 Here he offers his diary entry after a change of course leads this long-voyaging yacht on a jaunt through the rugged coastline and ancient ports of Croatia’s Dalmatian Coast. Golden Compass rounded the tip of Italy, heading into the Adriatic Sea and on to the medieval city of Kotor, Montenegro. Here, my teenage son, McKenzie, and I joined the yacht. A UNESCO World Heritage Site, Kotor is situated at the southern end of the Bay of Kotor, set approximately 15 miles inland from the Adriatic Sea. Dating back to 1550, the formidable walls of the Kotor Fortress protect the city that backs up to steep, rugged mountains, the ramparts rising 850 feet above the bay. 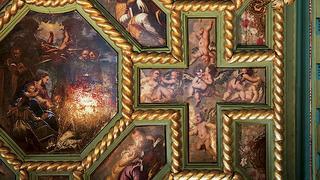 Inside its walls, charming architectural details, tiled roofs, plazas and winding stone streets appear much as they have for the past 500 years but are now filled with upscale restaurants, shops and inviting taverns. Although a lovely place, we would not linger in Montenegro – this trip was about exploring Croatia’s Dalmatian Coast. Steaming north into the Adriatic bound for Dubrovnik, the rugged Croatian coastline was laid out ahead of us. A line of deeply scarred towering cliffs soared hundreds of feet up from the sea. The occasional village hangs high above the sea on a precarious perch, surrounded by a desolate landscape where solid rock prevents all but the hardiest of vegetation to take root. 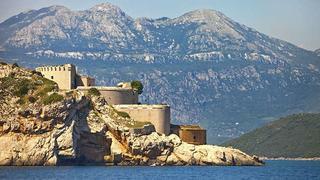 Golden Compass arrives into Dubrovnik and drops anchor near the entrance to the protected ancient harbour. Following dinner, the Nautica tender rushed us towards the great stone dock inside the city’s defensive walls for our first look at the magnificent old port. Dubrovnik was built on a peninsula offering enhanced protection from warring neighbours. The first settlement dates back to the 6th century, and it went on to serve as one of the most significant maritime and mercantile centres of the Adriatic during the 14th and 15th centuries. The massive wall that encircles the port stretches for 1.24 miles – a walk along it provides a great view of the historic city and coast. For another commanding vista, ride the tram to the summit for a spectacular aerial view, punctuated by the expanse of orange-tile roofs. Dubrovnik is a maze of narrow stone streets lined with shops offering everything from tourist trinkets to the latest international designer fashion. Too narrow for motor vehicles to traverse, the winding streets and steep steps require that everything from restaurant provisions to furniture be carried in on foot. Motoring through the night gave us the advantage of spending our days exactly where we wanted to be. The next morning dawned clear and calm as we pulled into the east side of Balun Bay at the island of BiŠevo and dropped anchor 100 yards from the Blue Grotto. 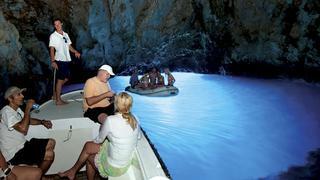 A natural cave at the edge of the sea, the Blue Grotto has a narrow opening suitable only for very small boats. We paid the cave’s gatekeeper and passed from daylight to darkness. Inside, with flashlight beams bouncing off the rocks, we wound through the dark into a large cavern illuminated by sunlight filtering in through an opening in the rocks above. The chamber burst with an intense blue glow from the sunlight reflecting off the water. The grotto has only two access points — the one we entered in the boat or by diving through an opening in the cave’s ceiling. By late afternoon, we were underway to the city of Split, a jewel on the “Dalmatian Riviera” 40 miles to the north. We dropped anchor in Split at 9:30 p.m., just in time for some serious nightlife at an open-air, waterfront nightclub—or so we thought. The young, hip night scene doesn’t get rolling until late, very late. By midnight our shore party, most of whom had been up since dawn, were ready to throw in the towel, but the club was just beginning to pulsate to the heavy beat with an ever-increasing volume and light show as hundreds of stylish young Croatians poured in ready for a good party. We gladly left them to it. Split is far from a party town, though; it offers an abundance of galleries, museums and historic sights, and it is the region’s cultural and administrative centre. The Palace of Diocletian located in the heart of the city is a World Heritage site and is considered to be one of the best-conserved Roman palaces in the world. A delightful mix of old and new —the Split Blues Festival was being set up in the square when we arrived. The city entertained us with open-air markets, street vendors, stylish shops, balconies dripping with beautiful flowers and incredible views into the past. We arrived at the park at 7:00 a.m. and cruised around the north end of Dugi Otok island, making a turn to the south where we would be protected in the island’s lee. The Kornati archipelago consists of 140 islands spread out over 124 square miles. This area bears more than a passing resemblance to Maine’s rocky coast, although the fishing boats are of a distinct European design and fewer trees line the coast. As the day came to a close, we were slowly cruising through the protected expanse of waterway in the national park devoid of any signs of population, we seemed to be alone in the world. 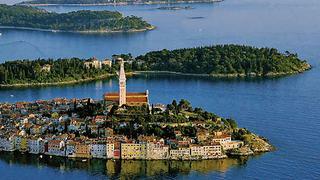 Next was a 12-hour, 125-mile run to Rovinj. Located off Istria Peninsula, it is among the top coastal holiday destinations in Croatia. With its buildings set at the edge of the sea, the old city appears to grow out of the water, rising up to the Cathedral of St. Euphemia. A walk through the charming streets leading to the cathedral took us by galleries, small hotels, bars and shops, their colorful doors and shutters vibrant in the morning light. A few miles down the coast, the Pula Arena caught our interest. Built in the 1st century A.D. during the reign of Emperor Vespasian, the former Roman amphitheatre that once hosted Gladiator sport is now a 5,000-seat venue for a variety of entertainment from film festivals to equestrian festivals to operas and concerts, while the underground passages now play host to viticulture exhibitions. This amphitheatre seemed to typify the Dalmatian Coast, a place where old and new collide, creating a landscape of ancient cities rich with modern diversions. As poet Robert Burns wrote, “The best laid schemes of mice and men go often awry,” but it isn’t always for the worse. For Golden Compass’s guests, a change in plans provided a fresh chance to discover new ports and people and see the sun set from a different part of the world.